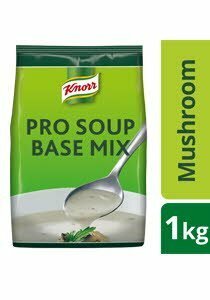 Knorr Pro Mushroom Soup Base Mix is made with real mushroom, roux and creamer to help you deliver a rich, creamy mushroom base in just 5 minutes, which is versatile for extension into a variety of mushroom soups, or as a base sauce for pies, sauces or casseroles. Modified Starch, Creamer (Contains Wheat, Milk Derivatives), Roux (Contains Wheat), Salt, Sugar, Mushroom, Permitted Flavour Enhancer (E621, E635), Palm Olein, Onion, Maltodextrin, Hydrolysed Vegetable Protein, Spices, Permitted Flavouring (Contains Wheat, Milk) and Permitted Caramel. All food additives used are from plant, animal and synthetic origins. May contain traces of cereals containing gluten, egg, fish, crustacean, mollusc, soy, peanut and tree nuts. 1. Dissolve 90g of Knorr Pro Mushroom Soup Base Mix in 1 litre of room temperature water. 2. Bring mixture to the boil, stir frequently, and simmer for 3 minutes or until thickened. 3. For a richer taste and texture, add milk or cream. Alternatively add additional ingredients like chopped sautéed mushrooms, and simmer until cooked. Store in a cool and dry place. Once opened, fold the bag and seal properly to keep the remaining content fresh.